Tradition pervades every aspect of life in this quirky little town, especially when it comes to the 35,000 students that descend every term time. From weeklong parties to celebrate the completion of the first year to stripping stark naked to celebrate graduation (I saw photographic evidence) to taking part in the annual “fado” serenade I began to wonder when they had time to study! 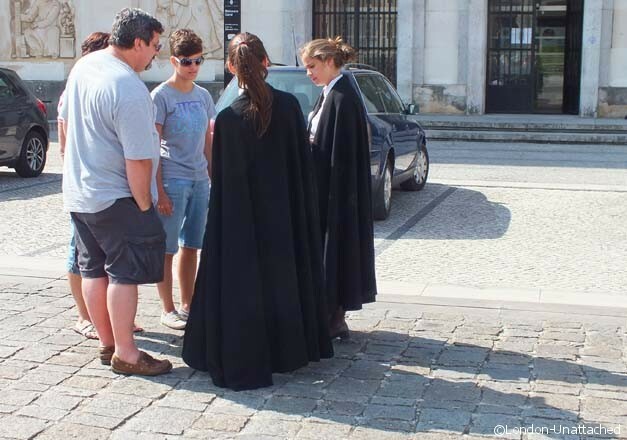 Students in Coimbra are instantly recognizable; wearing thick black Harry Potter-style robes, even in the scorching Portuguese sunshine, covered in symbolic badges and cuts to indicate everything from the individual’s town of birth to their relationship status. The effect to those who can decipher the strange code must be almost like a little walking facebook! The university itself is a stunningly beautiful place to visit. 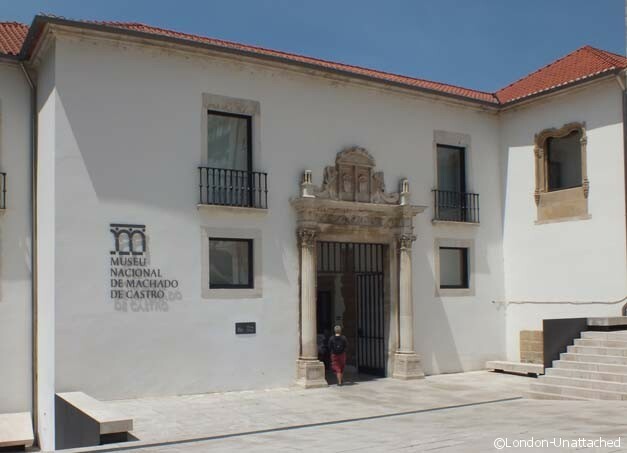 Sadly some medieval buildings were lost when former student and professor Oliver Salazar became the dictator of Portugal and decided to replace several ancient structures with the rather grim and utilitarian edifices that stand already greying outside the main gates. The main portion of the university however, is phenomenal. 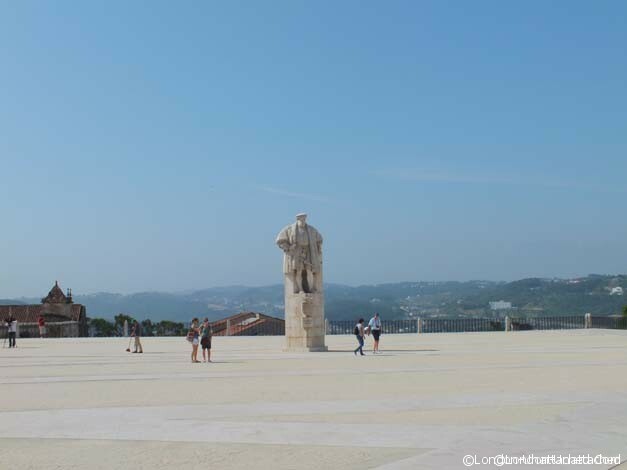 The central courtyard shines a dazzling white and looks out beyond the statue of John III (a dead ringer for Henry VIII) onto the red tiled roofs of the city. Wandering around the interiors of the main university buildings it almost felt like an onslaught of ornamentation. Like Tutankhamen’s tomb, everywhere you looked there was gold, all taken from Portugal’s highly lucrative relationship with Brazil and employed here to leave visitors in no doubt of the power and wealth of the Portuguese empire. This was no better displayed than on the magnificent wall mounted organ in the college chapel. 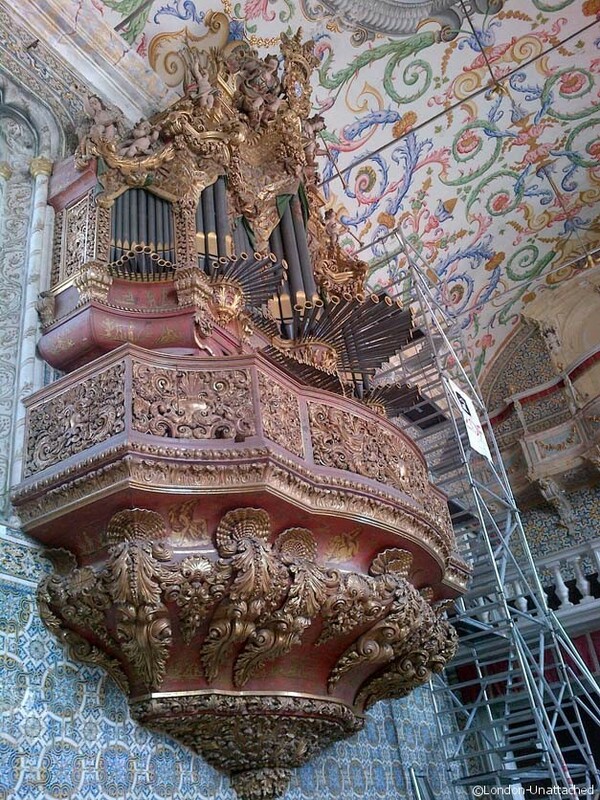 Its colossal size and outstretched, gold tipped pipes made it seem, whilst impressive, almost alien in the delicate baroque chapel. Another striking sight was the famous golden library where scenes of daily life in Macau, another imperial dependent, are rendered in more Brazilian gold. All this on bookshelves which, amazingly, were built with space behind to house the trained colony of bats who have lived there for hundreds of years eating any insects that threaten the collection of 30-40,000 ancient books. 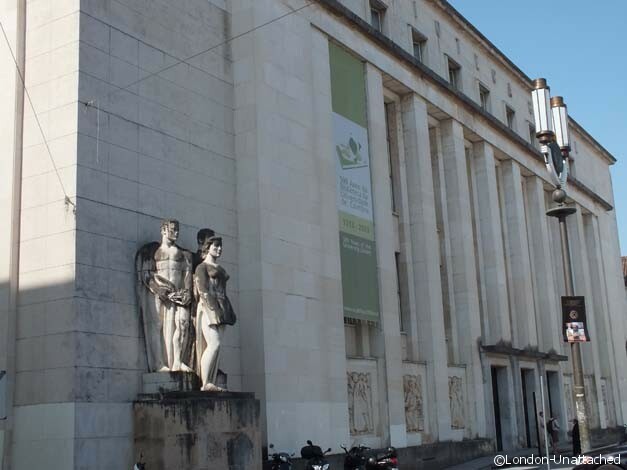 After visiting the heart of the university we went straight on to the National Museum. Newly renovated with a bright modern feel the collection was housed thematically from stone statuary, to wooden carvings, through to paintings and jewelry. Whilst the artifacts themselves were intriguing what I loved most about this little museum was the basement where you could explore the network of Roman tunnels and walkways that run under that section of the town. Beautifully lit and almost deserted I wanted to run around for hours exploring the dozens of little nooks and crannies filled with statues and carvings from the town’s Roman past. Another particular highlight for me was the collection of life size terracotta statues of the apostles at the last supper whose startlingly realistic faces came complete with actual teeth! Completing our trip around Historical Coimbra’s most beautiful monuments we visited the now abandoned 14th century convent of Santa Clara. Built initially by Saint Elizabeth, a local folk hero known for her Robin Hood-like attempts to improve the lives of the poor in Coimbra the regular flooding of the area did not deter the generations of nuns living there, desperate to preserve the work of their famous founder. Flooding in the convent got so bad that after a while the inhabitants were regularly using the first floor window to access the chapel since the ground floor was entirely inaccessible. 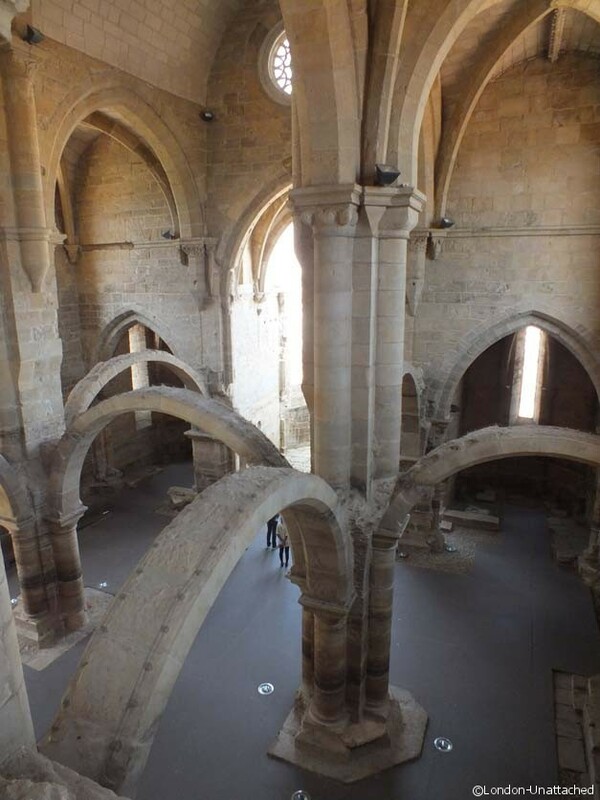 The onslaught of water, now prevented by a series of dams, has left the convent in ruins but what survives hints at the one-time splendor of the building. Some of the painted tiles that would have covered the interior still cling in places to the walls and the elaborately carved, vaulted ceilings still remain relatively untouched by the water that gutted the rest of the site. I love the architecture and the history! So amazing. I had no idea about the robes, what a great way to build community and still have individuality. such a great pictorial tour of Portugal.. It’s fascinating.. and I love all the details you provided. Wow, even the university is brimming with historicalness and culture! Love it! Also interesting about the students’ robes…besides having different color tassels to signify honor sororities/frats and perhaps what your specialization was, we don’t have anything remotely that cool in the US. This city is really culturally very different from any other. 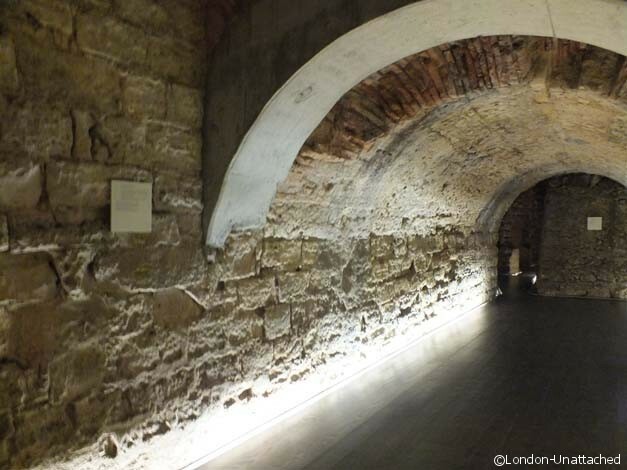 I would also have loved to experience the Roman tunnels. You packed a lot into that Portugal visit.